On Tuesday a benevolent transport system decided to divert my tube to Olympia so I took that as fate's way of telling me to take more exercise and walked to Putney Bridge via Brompton Cemetery and Eelbrook Common. I've been through the cemetery a few times after work, mostly when we had the warm weather. 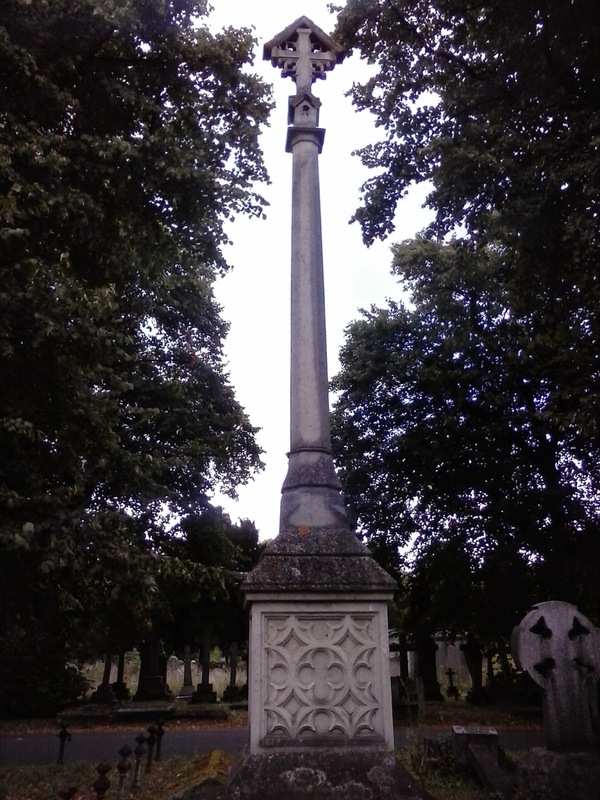 There are a number of famous people buried here and leaflets with their graves numbered and marked can be purchased from the Friends of Brompton Cemetery for a pound. I was only interested in 3. Emmeline Pankhurst, John Snow, and Henry Cole. Emmeline Pankhurst was the suffragette. John Snow the man who removed the handle from the Broad Street pump, thus proving that the spread of cholera in the area was due to contaminated water (actually this story is more complicated, but this is the version taught to children and it covers the broad facts). I always picture people cursing him at first because they had to walk further to get water, but there had been so many deaths in the area they were probably willing to try anything. Snow’s real contribution was his work on mapping cholera outbreaks, which eventually led to investigation into how water was becoming contaminated. I found two of my three. Ms Pankhurst's grave is a relatively traditional cross, but with art deco overtones. You can see it on the Wikipedia entry. John Snow's is a draped urn, even more traditional. But I couldn't find Henry Cole, and when I finally located where the grave should be the area was so overgrown (as much of this admittedly very large cemetery is), and the graves in the area so low, that I soon realised I'd have to give up. Having come from work I wasn’t dressed for fighting through brambles. I have found it online - and it still strikes me as a very modest grave. Not that Cole is short of monuments. A wing of the V&A is called the Henry Cole wing, a statue of him stands at the top of the stairs in the Natural History Museum and the internet tells me that there is a blue plaque both in Elm Row Hampstead and also in South Ken. I know Cole through his association with museums but he is also attributed to be the inventor of the Christmas card and wrote books, which I will be trawling project Gutenberg for later. There doesn't seem any point in posting pictures of those three famous graves - they're readily available online. I did take some other details which I thought interesting though. 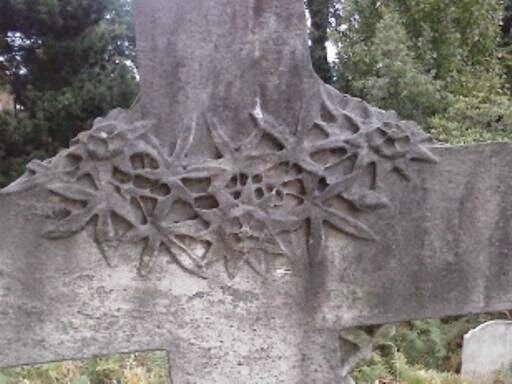 This cross has a wreath of what appear to be passion flowers carved as if draped over it. This is the reverse side. Again, I liked the detail of this monument. I also took the name of the person buried there, partly so I could look them up later, partly because it felt rude not to. 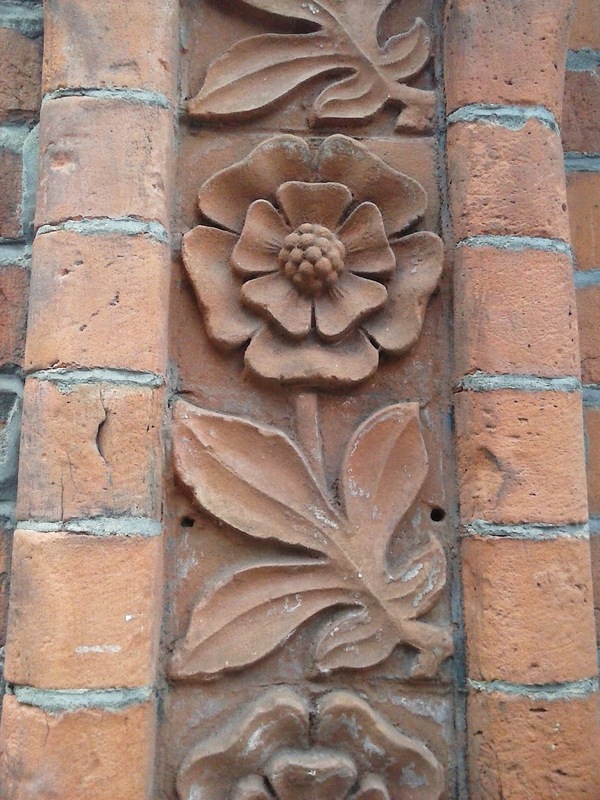 and this last is not from the cemetery, it's detail from the front of Cheniston Lodge in Kensington. There are some very attractive carved sunflowers around the upstairs windows as well, but I can't get a decent photo of them with my phone. I used to draw things I couldn't photo, but I'm horribly out of practice and even my attempts at simple maps of my walks (which I thought I might scan and add to my posts here) don't turn out the way I want. Too much fussy detail getting in the way of itself. I'll have to take a sketchbook on my next wander and persist until I draw something right.